Kivy is organizing its second application development contest!. This is a great chance for users both new and experienced to show off their skills and compete for prizes. Entries will be judged on a range of criteria accessible to both new and experienced programmers, so don’t be afraid to dive in! Only 2 hours of coding where needed for the first published version of the game. Then i learned on the Google Play Game services APIs for integrating a leaderboard and achievements. And after a couple of hours during the night, what i can say is: Be patient! Even if you follow the documentation carefully, you need to wait few hours before your app_id works on their server, even in test mode. There never warn us about it. # uid is the Google UID for the leaderboard you've created. # You can have multiple leaderboard. There is a little more code around that, but globally, using the new Play Games services APIs is now easy. I hope this little piece of code will help peoples to integrate it into their app. Somebody need to start a Python library for managing Google Play API and Game Center for iOS. 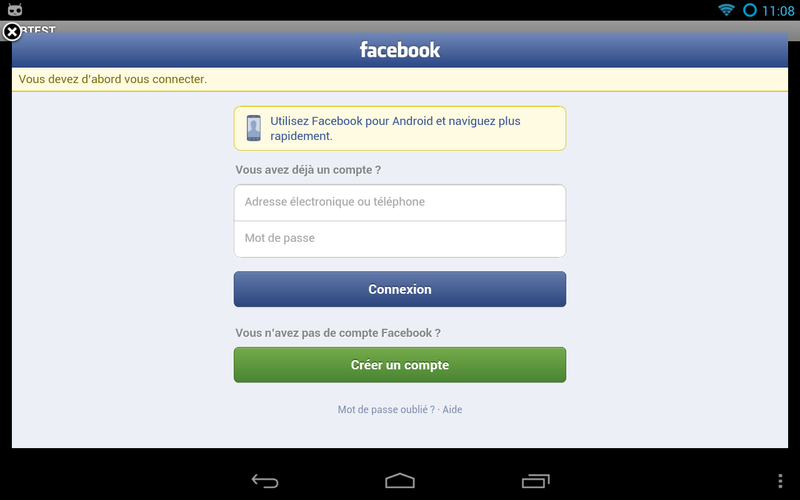 For another museum project, Arnaud asked me to see if we could integrate Facebook in an app on Android. The usual libraries are made for desktop, and manually open a webbrowser to handle the user authorization. But that’s not really nice for us, it would be nicer to have a native integration instead. Let’s see how we can use the official Facebook Android SDK. Now, you need to activate Native Android App. The package name is the same name as the one we will pass in --package when building the APK. The Class Name is the packagename/activity. Activity class is always the same for all the applications compiled with python-for-android. Add a new reference to project.properties to include the Facebook SDK. 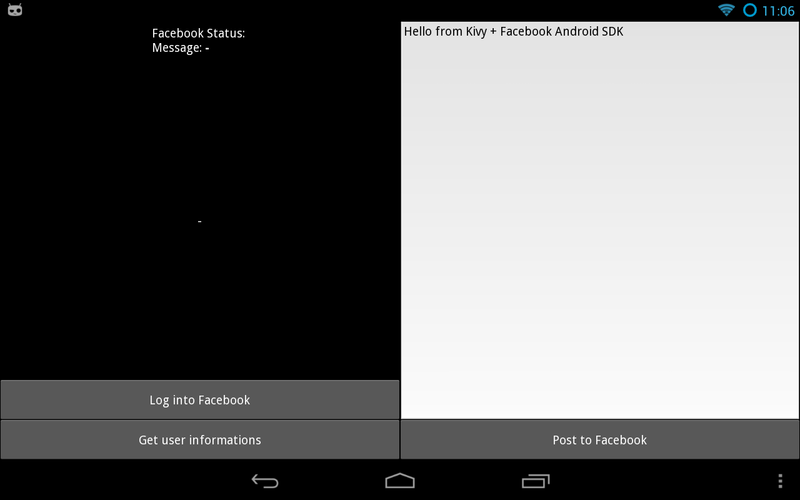 The path to the Facebook SDK MUST be a relative path, otherwise you’ll get issues during the next build. 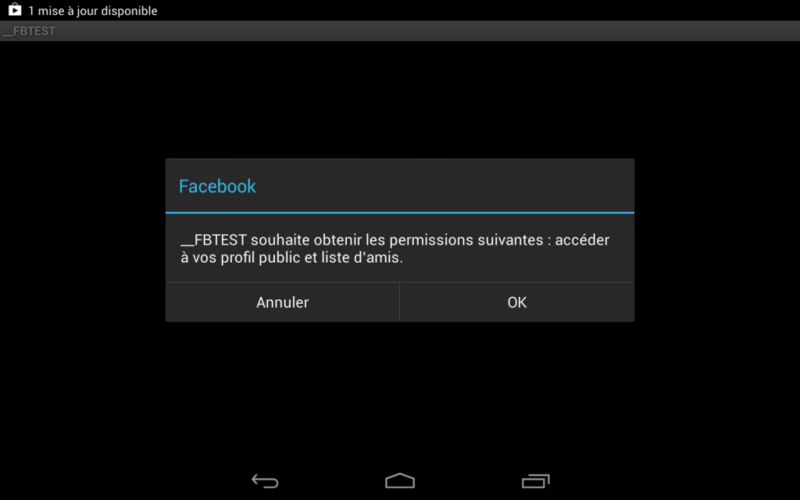 The Facebook SDK 3.0 require to separate read and publish permissions. To the user, it means you’ll have 2 dialog to accept. Even if you just want to publish to the application stream, you need to have the basic permission (read) accepted by the user before publish permissions. This is already implemented in the example app. 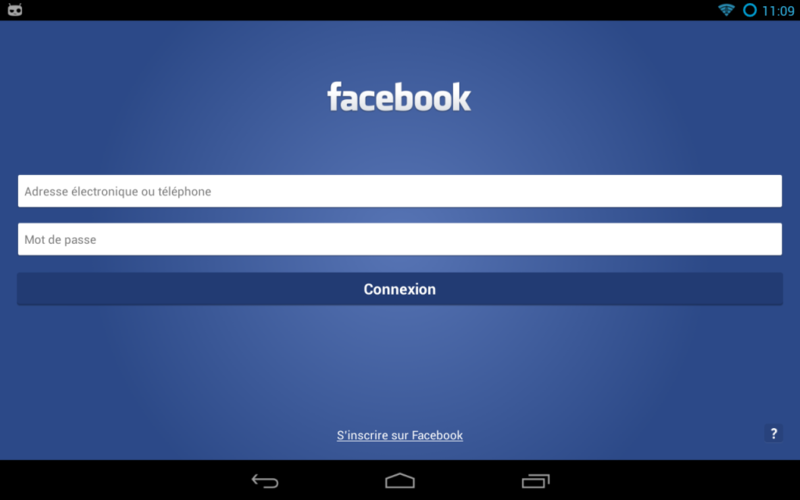 Depending if you have the Native Facebook application or not, you’ll have 2 kinds of authentification boxes. The application have now the right to post 🙂 The example post in the user stream as the application itself, not as the user. It’s called “publish_actions”. Obviously, when you use the Facebook SDK itself, you feel the pain of an API designed for Java. For every callback that Facebook want to call, you need to implement a Java class and define the callback method. Python is really simpler and fun to use. I don’t provide a wrapper around all the possible Request method you can do with Facebook. I just have an example for “post” and “me”. Both wrap “Request.newStatusUpdateRequest” and “Request.newMeRequest“. Please note that every request call must happen in the UI thread. Use the python-for-android/runnable module for that, with @run_on_ui_thread decorator. It was not easy to get it right, and it still complex to make all the pieces together. I’ve tried to use their own LoginButton (because they said that’s how they want it, everywhere), but i’ve not be able to use it in our app. Mostly because the LoginButton is a pure android widget, and because it doesn’t want to bring back the Activity after login. I was stuck too much time on it, and preferred to go in another way. Please note that you should not share an application with a fake Facebook button, the design / look-and-feel must be the same as the original one. I hope that will help some of you to get started ! ScrollView has been re-factored with new physics calculations. To be exact, the scrollview doesn’t calculate anything now, it just pass the touch position to an Scroll effect. This class calculate the movement’s velocity, and the over-scroll’s distance (means how far you scrolled out of the bounds). Then, we implemented 2 visual effects that use the over-scroll to make the scrollview act as a Damped spring, and/or to fade out the scrollview if you over-scroll too much. Garden: a separated organization for centralize user’s widgets and addons. You can create garden packages very easily, and import it in the source code with just “kivy.garden.packagename“. Few garden packages are already available! Kivy doesn’t run yet on the Raspberry Pi, and we need your help to crowdfund it! Even is Kivy is built to be compatible for GLES 2.0, we lack of a python EGL support. The plan is to add a new EGL Window provider, in addition to the detection of non-multitouch devices such as keyboard and mouse. We’re pleased to announce the Pyjnius project. It’s a Python library to access Java classes from Python, on the desktop or on Android. We found others libraries such as JPype or Py4j, but we weren’t happy with the design and the usability. Using Jython wasn’t an option either, because we wanted to use the library within our python for android project. What we demonstrate here is the autoclass function that create kind-of proxy that reflect all the methods and fields available from the Java class java.util.Stack. More examples are available in the documentation. We have a mapping between Java/Python type, native arrays, support for methods with multiple signatures, and a lot more. We are using Cython + JNI internally. The performance cost is minimal. The library is already available for Python for android. The library have been done by Gabriel Pettier and myself, under the Kivy organization. Kivy has now added official support for IOS platform. You can now package your Kivy application for the Ipad (and other iOS devices, testers needed). For the full story on the multiple Apple limitations we are working with, i want to share the hardest part for Python integration: Apple’s prohibition on using dlopen() to load dynamic libraries. In a typical case, a compiled Python library’s extension is a “.so”, and the “.so” is dlopen() at import. This way, Python will always look at the application binary, and never need to use dlopen(). 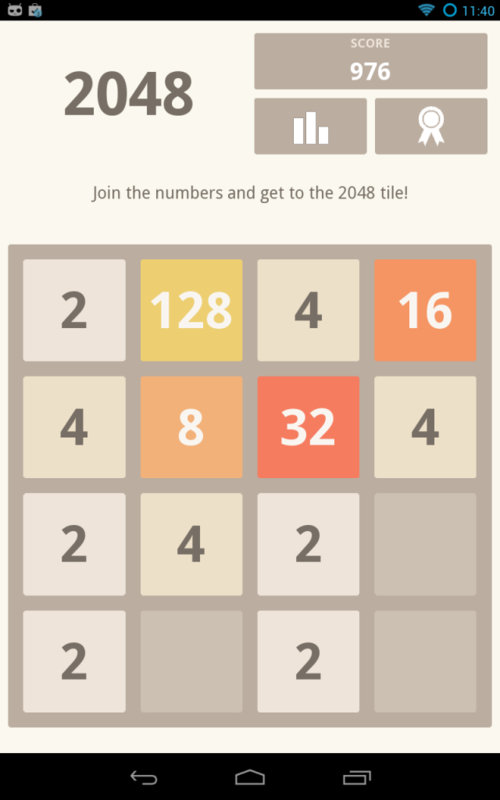 If you are worried that Apple would reject a Python-based application, or even using Kivy altogether, we have tested it for you: the game that won the Kivy contest has been packaged for IOS, submitted to Apple… and accepted. You can found Deflectouch on iTunes (source code). Anyway, Kivy is now officially supporting 5 platforms: Windows, Linux, MacOSX, Android and IOS! I’m glad to share a new project called Python for Android. The goal of this project is to package your python application into an APK. The project is under the umbrella of Kivy organization, but is not designed to be limited to Kivy only. Read the documentation to correctly install the NDK/SDK Android, and set the needed environment variables. # create a simple distribution with python + PIL + Kivy ./distribute.sh -m "pil kivy" # create a distribution with python + openssl + pil + kivy ./distribute.sh -m "openssl pil kivy"
./distribute.sh -m "openssl pil kivy"
A directory dist/default will be created, including the result of the whole arm compilation. Available libraries as for today: jpeg pil png sdl sqlite3 pygame kivy android libxml2 libxslt lxml ffmpeg openssl. Only one java bootstrap available, using OpenGL ES 2.0. Only Kivy toolkit is working. I’m sure that other people can enhance it to add other toolkit recipes. But for example, pygame is not gonna to work because the android project is OpenGL ES 2.0: pygame drawing will not work. 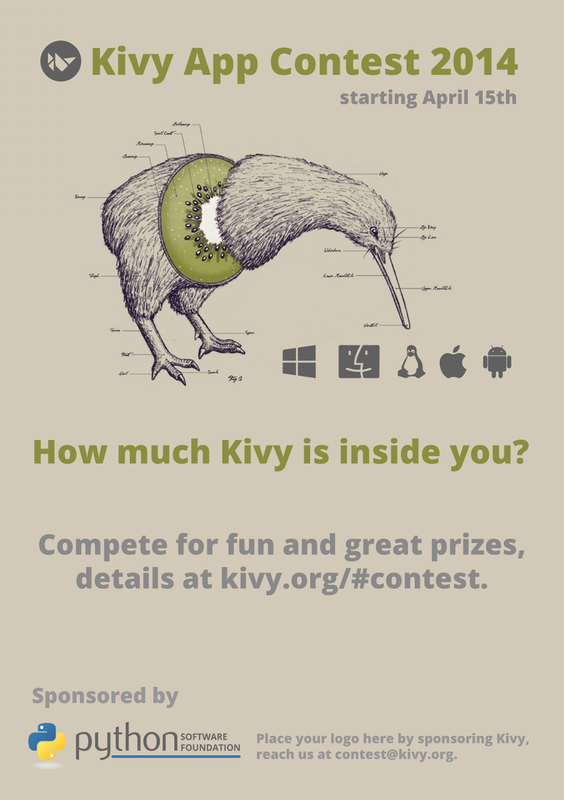 Kivy, an open source project for building cross platform applications and user interfaces, is announcing its 1st programming contest. The contest will start with the publication of official rules on January 1st. Registrations will be accepted through January 25th, and submissions will be accepted through January 31st. Prizes include Nvidia Tegra 2 android tablets from NotionInk, One-year “bronze” plans and t-shirts. The goal of the contest is to encourage interested developers to learn more about Kivy, which is a cross platform Application and User Interface software library for the python programming language. Kivy applications run on Linux, Windows, OSX, Android (and iOS). The framework supports most inputs protocols and devices like WM_Touch, WM_Pen, Mac OS X Trackpad and Magic Mouse, single/multi touch screens, Mtdev, Linux Kernel HID, TUIO, and uses pure hardware accelerated rendering to enable developers to really take user interfaces to a new level. The contest is sponsored by NotionInk, an indian company that designs tablets PCs, and Github, a web-based hosting service for software developments projects.